NCERT Solutions for Class 10 English Chapter 22 Unit 5 Promoting Tourism are provided here with simple step-by-step explanations. These solutions for Unit 5 Promoting Tourism are extremely popular among class 10 students for English Unit 5 Promoting Tourism Solutions come handy for quickly completing your homework and preparing for exams. All questions and answers from the NCERT Book of class 10 English Chapter 22 are provided here for you for free. You will also love the ad-free experience on Meritnation’s NCERT Solutions. All NCERT Solutions for class 10 English are prepared by experts and are 100% accurate. 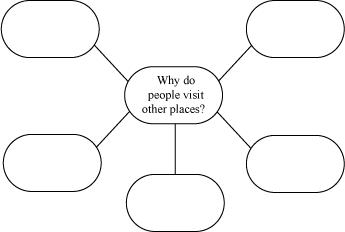 Why do tourists visit a place? Do you think Indian tourists and foreign tourists visit places for the same reasons? Tourism refers to travel for predominantly recreational or leisure purposes or the provision of services to support this leisure travel. 6. In search of peace and relaxation, away from one’s monotonous life. Most of the reasons to visit places, like learning a place’s culture and ethnicity and tasting good food, are the same, irrespective of the tourists being Indian or foreigner. What evidence does the author provide to support his view that our efforts to attract foreign tourists have been unsuccessful? The author uses published statistics like: India managed to attract just 5.1 million tourists in 2009. Malaysia, on the other hand, attracted 23.6 million foreign arrivals and China attracted 50.9 million tourists in the same year. Malaysia and China entered tourism markets decades after India and yet they rank 9th and 4th respectively while India does not figure in the top 10 tourist places in the world. What, according to you, may be the reasons for such a bleak scenario? There can be many causes for India being a less attractive tourist destination. A few of them could be lack of safety and security, rise of terrorism, lack of infrastructure, unfriendly behaviour of the locals towards the tourists, lack of hygiene and bad maintenance of historical monuments. What is the shift in tourism policy recommended by the author? What are his arguments for such a shift? The author suggests that instead of trying to attract foreign tourists, the focus could be Indian tourists. Indian tourists are well-heeled, tolerant, keen to discover India and impatient to go abroad. Unlike before, their attitude towards travelling has changed for the better. What are the two initiatives taken by Karnataka that signify marked change in its marketing strategy? a) The state’s glamorous Golden Chariot Tourist train, designed for foreigners, now also does a shorter Jewel of the South tour for upper middle-class Indian tourists. b) The state’s very successful and luxury class, Jungle Lodges and Resorts,has created a no-frills clone in their Jungle Camps and Trails for a younger clientele, tapping the growing ranks of junior executives. Why have Kerala's tourism figures grown while those of some other states have remained static? The major focus for all the states was to attract foreign tourists. However, Kerala made domestic tourists the focus and allocated their tourism resources accordingly. By tapping the tourism market in the non-metros, Kerala’s tourism has become very successful. The other states still depend on the fickle, demanding, overseas market because of which they remain static. Why does the author say that we should now make efforts to attract there domestic traveller? What are the areas that we should focus on to achieve it? In 2009, 5.11 million foreign tourists visited India. On the other hand, 11.07 million Indians went to tourist destinations outside India. The author says that in order to decrease the outflow of tourists and rupees, the domestic tourist should be made the focus of promotional activities. Improvement of infrastructure like roads, airports and hygiene are some of the areas which should be focused on. Union Territories reported that more than 650 million domestic tourists had visited them in 2009, whereas, a meager 5.11 million foreign tourists visited India. The author says, “Clearly Tourism, like Charity, begins at home.” as the Indian market is more lucrative than the international one. Find words or phrases from the passage that mean the same as the following. What has been the general trend in the number of tourists visiting Palwal Pradesh over the last five years? Over the last five years the total number of tourists visiting Palwal Pradesh has shown a rising trend. The number of Indian tourists visiting Palwal Pradesh has gone up slightly, while the growth rate in the number of foreign tourists has certainly been higher than the former. Which groups have shown increases, and by how much? Both groups of Indian and foreign tourists have shown an increase in number. The number of Indian tourists has almost doubled (from about 25,000 to close to 50,000) over the past five years. On the other hand, the number of foreign tourists has shown a much higher growth rate, i.e. from close to 40,000 to nearly 100,000. Suggest reasons for the changes over the last five years, for both groups of tourists. For each group of tourists, which is the most popular type of accommodation? For Indian tourists, guest houses are the most popular type of accommodation while for the foreign tourists 5 star and 4 star hotels are the most popular type of accommodation. How many tourists of each group stayed in these most popular types of accommodation? According to this year’s figures, 25,000 Indian Tourists stayed in Guest Houses while 50,000 foreign tourists lived in 5 star or 4 star hotels. Suggest why different types of accommodation are popular with different types of tourists. The economy of foreign countries is better than that of India. This is the reason why they can easily afford to live in 4-star and 5-star hotels in India. On the other hand, Indian tourists have a limited travel budget due to which they prefer to stay in guest house. This could be one of the reasons for such choices of accommodation. What does the final column mean? Why is it important? The final column shows the occupancy rate in each of the different types of accommodation. It is important the occupancy rates in order to find out the needs and preferences of the tourists. There are three 5 star hotels and 13 youth hostels, yet each type of accommodation has the same number of beds. Explain. 5 star hotels are in demand due to foreign tourists and the business class customers. Youth hostels are inexpensive accommodations chiefly made for students and young people. This is the reason why both these types of accommodation have a sizeable number of beds in order to accommodate their large clientele. Which are the two most popular types of accommodations? Youth hostels (95% occupancy rate) followed by 4 star hotels (92% occupancy rate) are the most popular types of accommodation. Which types of accommodation have occupancy rates of 85% or over? 5 star hotels, 4 star hotels and youth hostels are the types of accommodation that have occupancy rates of 85% or over. Unit-1 Do Indians get enough sleep?